The effectiveness of your school district will be determined by the people who work for you. School districts accomplish their goals through people. How you select, develop, motivate, and manage the teachers and school leaders in your school district matters more than curriculum, software, or even facilities. Allow us provide some insights on how to accomplish your district goals through the people who work for you. Develop effective and customized teacher selection tools to recruit and hire quality teachers. One of our clients told us, “Hiring the right staff is the most important thing we do.” We would have to agree. We can help you develop customized and effective hiring practices that are fair and legally defensible. Pay and benefit plans are one of the most important ways districts communicate value to employees. We can help your district evaluate and develop compensation and benefit plans that are internally equitable and externally competitive. Create customized solutions to measure and increase teacher motivation and engagement. Identify factors relating to teacher turnover and help leaders address those factors in leadership and environmental factors. Conduct job analysis for school districts to identify critical factors related to effective teachers and staff. Create customized electronically stored job descriptions to communicate essential tasks and competencies. Assist in the development of teacher evaluation tools that are customized to the local district, not state and national templates. We understand the unique nature of school districts and their human resource needs. Here is what one of our most recent clients had to say. One of the largest obstacles to student success may not be student engagement, it may be teacher engagement. 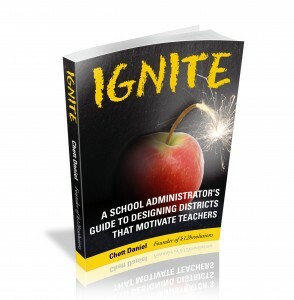 Ignite provides a framework ensuring organizational tools and strategies within the district support a more motivated and engaged teaching staff. Current topics related to organizational effectiveness, leadership, and management of human capital. Important updates regarding HR law and policy and how it could affect school districts. Gain insights through our interviews with thought leaders in human resources and school leadership.